More and more people are looking for places that are reachable with public transports especially when they want to spend their time in a quite area to get in contact with nature. It could be because they love environment and would like to be more “green”, or simply because they are reaching Italy with a flight. Now it is the perfect time to ski and if you are planning your skiing holiday in the Dolomites you need to know how to get there easily. I am going to talk about Pusteria Valley in South Tyrol where you can move yourself by taking a train going from a ski area to another.The Pusteria Valley, known as Val Pusteria or Pustertal in Italy, is in South Tyrol, a region where people speak German, Italian and Ladin. The Pusteria Valley, known as Val Pusteria or Pustertal in Italy, is in South Tyrol, a region where people speak German, Italian and Ladin. I was there last weekend and it was all perfect. Also when there is no snow or not a lot of it, you don’t have to worry because tracks are always perfect. You can get there in various ways. If you come by plane, choose to land in Verona or Bolzano airports. Then go to the railway station and take a train to Fortezza. Here you have to change for the one that goes to Lienz (Austria). You could easily reach one of the towns of this valley, like Brunico / Bruneck, Perca / Percha, Valdaora / Olang, Monguelfo / Welsberg, Villabassa / Niederdorf, Dobbiaco / Toblach, San Candido / Innichen, Versiaco / Vierschach or Sillian (that is already in Austria). The same thing if you come from everywhere in Italy by train. You have to reach Fortezza and then you have to change train. In that line there is an electric train waiting for you every 30 minutes. You can also reach the valley with your car by A22 highway until Bressanone – Brixen and then taking the state road SS49 until your destination. Please note that there is always traffic there, that is why I suggest you to use the train. Or, if you arrive from Venice, take the highway A27 to Belluno and then the state road SS51 until Dobbiaco / Toblach to reach this beautiful valley. How does this train work? 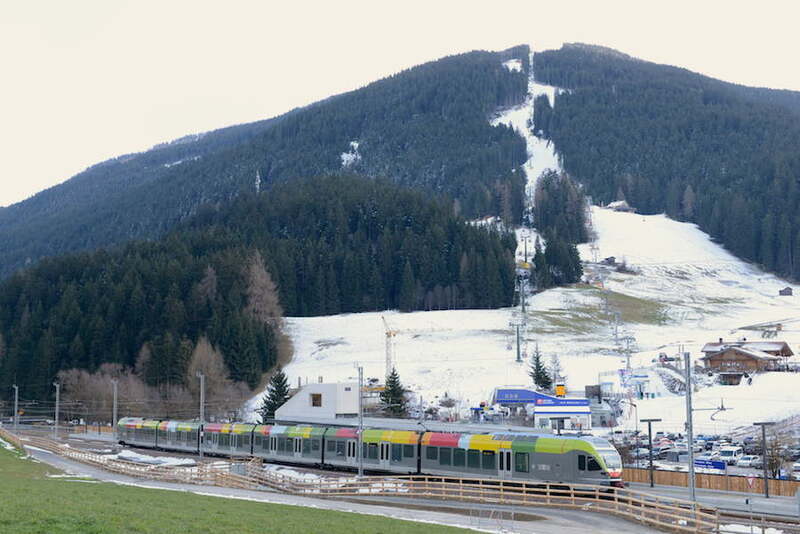 The Pustertaler Ski Express connects Plan de Corones, near Brunico / Bruneck, with Mont’Elmo, near Versiaco – Vierschach, and the Croda Rossa mountain, in Sesto / Sexten, with an electrical train in only 30 minutes. You can get on the train bringing your ski and snowboards without leaving your ski shoes. No thinkings about traffic and parking! Now this area is one of the biggest places where to sky in Italy. You can reach South Tyrol with train or car and then you can use the train to reach every day a different area. It is something that sounds incredible but it is true. 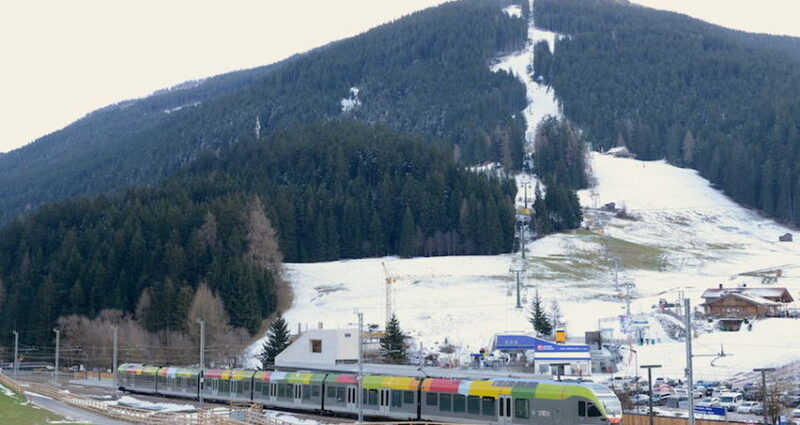 With this train, you can ski over 200 km of tracks with only one ski-pass, that includes also the train ticket. Which services can you get there? Services are special: both stations, Perca / Percha and Versiaco / Vierschach have a ski storage area, a ski rent, an assistance point, free internet WI-Fi and refreshment, and in Versiaco you can find also a supermarket. Here you would find no architectural barriers and you can easily reach the lifts that are only 100 mt from these stations. Val Pusteria is working to connect more and more different ski areas. In 2014 they inaugurated the connection with the Ski Pustertaler Express, the new lift that connects Sesto / Sexten and Croda Rossa. But they are thinking greater: they are going to build new lifts and tracks to better connect also Monte Croce Comelico, in Veneto, now linked by bus. And then, they are considering to connect also Auronzo di Cadore and Sillian, in Austria. So, it would be really a big ski area across different regions and countries. Wonderful! For further information you can take a look to the official website of Ski Pustertal Express and to the website of Sextner Dolomiten. Read something else about Italian mountains!